At a recent ClickerExpo, a friend appeared to be uncomfortable. I could see it in her posture and facial expression. When I asked her about it, she said her back was hurting. I offered her a bit of TTouch bodywork, and, after a few minutes of bodywork, her face began to relax and she said she felt much better. It’s still reinforcing for me to see this response to subtle touch, and I’ve experienced it countless times over the years with both dogs and humans. Tellington TTouch Training (“TTouch”) is one of the approaches I use in my practice. Not limited to bodywork, TTouch includes movement exercises, loose-leash walking techniques, empowering animals to make choices using various equipment and set-ups, and other tools. But the bodywork part of Tellington TTouch Training is what most people think of as TTouch. This article focuses on the bodywork element for dogs, and provides key techniques to recall during practice. You will see how TTouch bodywork is different from patting your dog on the head or hind end. The benefits of TTouch bodywork can include lowering stress levels, promoting calm, and reducing tension in the body—and, therefore, improving posture and gait. These benefits often produce positive changes in behavior as well. TTouch bodywork can also enhance the relationship between the dog and the person performing the bodywork. One thing that makes TTouch bodywork different is the goal of being completely present with your dog during the bodywork session. There’s a big difference between mindful, technique-guided touch and the random, far less mindful patting, petting, or rubbing your dog while chatting with someone, thinking about a to-do list, or watching a film. A very important aspect of TTouch, and one which requires the human to be present, is staying alert, observant of, and attentive to a dog’s body language. You have to be present doing this work in order to read the dog’s body language, even during the initial approach, and before even touching the dog. It’s important to be skilled in reading a dog’s body language, noticing even subtle signals, in order to know when to remove your hands and when to continue. It’s essential to provide the dog the choice to move away, or to let you know, even subtly, that a break is needed. I often ask what the dog wants with the back of my hand. I employ an almost “drive-by” touch to see what the dog’s response is. Does she come back or stay with me? Does she move away and stay away? Examples of signs that your dog might not want to be touched or that she has had enough include: turning her head away, yawning, getting up, flicking her tongue toward her nose, freezing or being very still, whale eye (wide-eyed with white showing), whipping her head around, hiding or covering a body part so you can’t reach it, fooling around, panting, tucking her tail, and, of course, growling, baring teeth, and other escalating behaviors. To learn more about signs of stress in your dog, see How to Interpret Your Dog’s Body Language. To vary your touch, try stroking down your dog’s body or ears. Or, move the skin in a circle-plus-a-bit-more pattern with your fingers making contact, or use your entire hand. You can even use the back of your hand. The back of your hand may appear less threatening when you reach out to touch a dog. Experiment with different surfaces of your fingers, including tips, pads, from the second knuckle to pads, etc. Another variable that impacts how dogs accept touch is how much pressure is used in that touch. In TTouch bodywork, we most often move the skin without trying to change the muscle fibers or muscle tension under our hands. You can get a feel for pressure by using just enough pressure directly on your own skin to feel your fingers move the skin. You will see your fingers move your skin, still remaining connected to where you placed your fingers. Attempt to move your skin a small amount—from side to side, up and down, in a circle, and in a circle plus a bit more. The more of your fingers or hand’s surface you use to move the skin, the more warmth there is where you are touching. A trick to get the hang of moving the skin is to draw a dot or find a freckle on your skin, connect your finger to this landmark, and stay in contact with the landmark as you move the skin, making sure you don’t glide over and away from the landmark. Once you can move the skin, try varying the pressure to see how more pressure feels compared to very little pressure. Aim for something in the middle. The pressure should not be tickly. Once you can move the skin under your fingers or hands, you will able to change locations on your dog’s body. You don’t want to work the same place on your dog’s body more than one repetition. If you are working with the shoulder, try moving your hand or fingers a bit so that you are in contact with a different part of the shoulder. Either slide to the next location or pick your hand up and move it a bit. If your dog enjoys having her ears stroked, try moving to different parts of your dog’s ear after each stroke. Or, if you are stroking the entire body, slide over a bit to stroke the next area. The next point to focus on during bodywork is the speed of your touch—how fast your fingers or hands move as they stroke or touch your dog. If you move your hands quickly, you are likely to “wake” the dog’s nervous system by telling her it’s time to get moving. Using the entire hand and moving slowly is warm and calming, and likely soothing, as long as you aren’t using too much pressure and your dog continues to welcome your touch. Try moving at half of your current speed to check the speed of your touch and to practice moving more slowly. Another thing to watch is your own body mechanics. You want to be comfortable and relaxed. Make certain that you are breathing easily as you initiate bodywork with your dog. Animals often cue off of hesitation or signs of discomfort. As you experiment with touch, watch that your wrist is in a neutral position, not flexed or extended. In other words, your wrist should not be in a bent position. TTouch bodywork will most likely enhance and strengthen your relationship with your dog. If you practice and incorporate each technique or variable within TTouch bodywork, adding in one at a time, you’ll learn to combine them all to provide relaxing bodywork for your dog. Your dog, your family, and you yourself may all benefit from TTouch, experiencing less anxiety and more calm. Other health and behavior gains are quite possible, too. Exploring TTouch bodywork will most likely enhance and strengthen your relationship with your dog. Editor’s Note: For more of Lori Steven’s video demonstrations of TTouch, see Tellington TTouch for Dogs: A Workshop for Improving Health, Behavior, and Performance and Tellington TTouch Techniques: Walking in Balance with Your Dog. 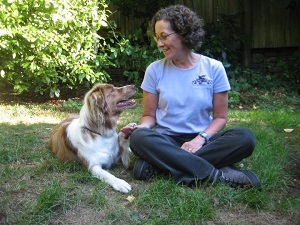 Lori Stevens (CPDT-KA, SAMP, CCFT) is an animal behavior consultant, a Certified Canine Fitness Trainer, an animal massage practitioner, and a Senior Tellington TTouch® practitioner. She uses humane, friendly, scientific and innovative methods, in an educational environment, to improve the health, behavior, performance, and fitness of animals. Lori's most recent of 3 DVDs is co-presented with Kathy Sdao and called The Gift of a Gray Muzzle: Active Care for Senior Dogs --it focuses on improving the life of senior dogs. Lori gives workshops worldwide and has a private practice in Seattle, WA. Lori is also the creator of the Balance Harness™. See SeattleTTouch.com for more information.